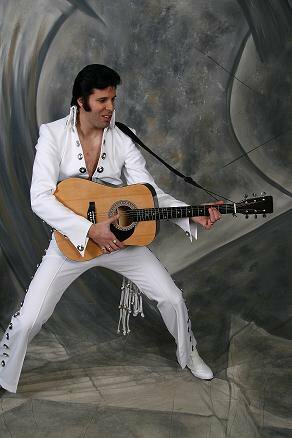 Jay Allan is the top Elvis act in the Eastern U.S. His performance will leave you All Shook Up! Colorful jackets highlight his leg and hip movements and light up the eyes of onlookers. His vocals are haunting and the resemblance is shocking! Jay Allan, The Ultimate Elvis Tribute Artist, has been extremely successful and authentic as a fan first and foremost of Elvis Aaron Presley. Jay perform's all era's of Elvis' life from the 50's to the 60's & 70's. He is separated from all other impersonators. With the moves down pat, he?s been noted as one of the top performers on the circuit, with an accent on fashion. His show is becoming the top Elvis act in the Eastern United States and based out of the Lehigh Valley in PA, travels all over the world. He puts on a performance that will leave you All Shook Up! The colorful lamed jackets highlight his leg and hip movements and light up the eyes of onlookers. His vocals are haunting and the resemblance is downright shocking!